SATANIC GOATSHEAD OF MENDES PENTAGRAM USED IN BAPTIST CHURCH BULLETIN! SATANIC GOATSHEAD OF MENDES PENTAGRAM USED IN BAPTIST CHURCH BULLETIN! SYMBOL OF SATAN IN A CHURCH BULLETIN! Subtitle: The Apostasy of the Christian Church is sufficiently deep and wide enough now that the enemy of our souls has the audacity to sneak in such a blatant symbol of his power! Ramifications are huge, both globally and individually. Please examine this church bulletin carefully. It was printed for many churches, but an Independent Baptist Church was one who carried this bulletin, on December 23, 2001 which would have made this Sunday service the last one before Christmas. This timing is such that it not surprising to see the Scripture chosen was from the wonderful account in Luke, chapter 2, verse 11: "For unto you is born this day in the city of David a Savior, which is Christ the Lord." The candles on each side of the stained glass display are also standard, as is the songsheet in the foreground. Most Christians would give this picture just a cursory glance, not noticing anything amiss about it. However, a Cutting Edge subscriber, a former practitioner of the occult, instantly noticed the Satanic Goatshead of Mendes right in the middle of the stained glass circle! Notice the 5-pointed star in the middle; rather than being the White Magic Witchcraft star on our flag, with which we are familiar, with one point up and two down, this is the inverted Black Magick star with two points up and one down. This is a most evil symbol in Satanism, exceeded only by the hexagram. It is known as the Goatshead of Mendes Pentagram. Of course, this shocking fact brings up all sorts of questions, does it not? Some of the questions revolve around motive, personal intent, which are above and beyond our ability to know. However, one fact is quite plain once you closely examine this Goatshead of Mendes Pentagram; someone drew this pentagram intentionally, as it contains a number of occult symbols, beyond the Goatshead Pentagram itself. This Goatshead is of the "evil" Black Magick Witchcraft, not the "good" White Magic variety. Let us examine first the Pentagram to see how important it is to the worshipper of Satan. This interlocking pentagram, shown above, is the one used most often by a witch or wizard to call forth a supernatural being into this dimension. Much of the power exercised by witches and/or wizards is the ability, through the correct ritual, to call a demon into our dimension in order to carry out their wishes. Notice that the five points of a pentagram are simply triangles, interlocking. One the reasons a pentagram is used to invoke demons into this dimension is that triangles -- because they are 3 sided, the same number as the Pagan Trinity -- are so revered. Demons actually come through one of the triangle "horns" of the Goatshead, or can come through just a simple triangle, as you will see later. However, the Black Magick witch or wizard would use a pentagram not interlocking and with the two points up and the one down. But, then, Goodman tells us that the Goatshead has "hairy jowels and beard"! At this moment, take a look at the center point of this stained glass circle, at the goatshead, above. Notice that the "hairy jowls and beard" are located exactly where they are supposed to be, i.e., at the bottom of the goatshead, to the right and to the left of the single point downward. This critical fact is strong proof that this Goatshead Pentagram was deliberately created by an occult artist who knew exactly what they were doing, as you can verify by looking at the Sabbatic Goat picture below. This picture is also known as The Baphomet , and is a true depiction of Satan. The Pentagram is the geometric symbol of his top horns [2 points], his ears left and right [2 points] and his goat's mouth [1 point]. The Goatshead of Mendes Pentagram represents this head and horns of The Baphomet [Sabbatic Goat]. Thus, you can see that this pentagram in the church bulletin does have hairy jowls at the bottom and on each side of the chin area, exactly where they should be in a Satanic Goatshead Pentagram! Notice also in The Baphomet depiction, that he has a White Magic star in the middle of his forehead, with one point up and two points down. Now, please look again at the Goatshead in the Church Bulletin. In the middle of the "forehead" of the Sabbatic Goat is a stylized pentagram with one point upward; this is an excellent representation of the "White Magic" pentagram with its one point upward and is located in the middle of the forehead of the Baphomet [Sabbatic Goat]! When I saw this White Magic pentagram located in the middle of the forehead, just as a Satanist would depict it, all personal doubts vanished as to whether this depiction was done deliberately. It had to have been created deliberately! Now, carefully note this Eastern Star Masonic depiction of the Goatshead Pentagram. Notice how each of the five points here are carefully drawn into triangles . Around the center of the "forehead", bottom lines are carefully drawn so each of the five points becomes a distinctly drawn triangle! Now, go back to the Church Bulletin; you can see that the artist accomplished the same careful division of each of the five horns with a straight line at each horn point around the forehead. You may have to save a copy of this church bulletin to your paint program and then use a magnifying lens to enlarge the picture to clearly see these bottom straight lines, which form the triangles. Thus, each of the five horns is an exactly formed triangle. What is the importance of a triangle? Goodman states, "The triangle is regarded by occultists as an especially magical symbol, for it refers to the notion of 'three' which is believed to represent the highest realm of the spiritual world ... the triangle, besides being an important religious symbol, is directly linked with the idea of the Trinity ..." [Magic Symbols , p. 60] When White Magic wizard, Goodman, states that the triangle is "an especially magical symbol", he means it contains great occult supernatural power, the kind of power over the supernatural world that wizards like Eliphas Levi, below, can wield through Satanic ritual. Further, the triangles of the Pentagram forms a portal from the supernatural dimension into which a conjured demon can appear. Take a look at the depiction below of the 33rd Degree Freemason, Levi, conjuring up a demon, to see how this works in reality. Remember, this picture, below, of the Wizard Levi conjuring a demon into this dimension occurs regularly in Satanic rituals. This kind of power is what witches and wizards desire. 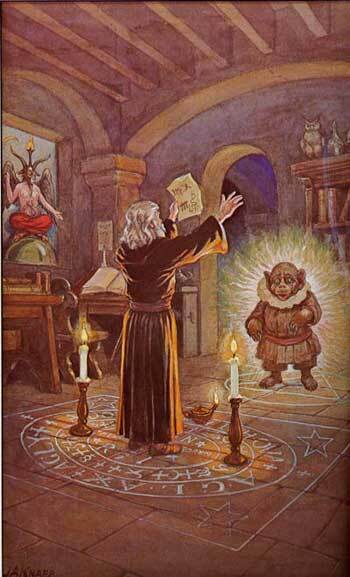 This picture shows 33rd Degree Mason, Eliphas Levi standing inside a specially created circle conjuring up the demon spirit Apollonius of Tyana [Manly P. Hall, 33rd Degree Mason, An Encyclopedic Outline of Masonic, Hermetic, Qabbalist and Rosicrucian Symbolical Philosophy" Being an Interpretation of the Secret Teachings Concealed Within the Rituals, Allegories and Mysteries of All Ages, H.S. Crocker Company, Inc., 1928, p. 101; also mentioned by David Carrico, Scottish Rite Journal, in article, "Manly P. Hall: The Honored Masonic Author, Evansville, Indiana, 1992, p. 17; listed as a book recommended by the Macoy Publishing and Masonic Supply Company; reprinted by Dr. Burns, in her book, Masonic & Occult Symbols Illustrated , with permission]. 1. Goatshead Pentagram : While the church bulletin has one goatshead pentagram right in the middle of a circle, Levi is standing on a rug in which the pentagrams are in each corner, with each pentagram facing him with the two points toward him forming the goatshead. 2. Triangle Critically Important: In the Levi picture, a Demon has appeared within the triangle surrounded by a circle. In the church bulletin, each of the horns of the pentagram form a triangle, plus we see more triangles in the church bulletin depiction in the large circle surrounding the goatshead, a point we explain in detail further along in this article. 3. Two candles lighted in a candlestick. 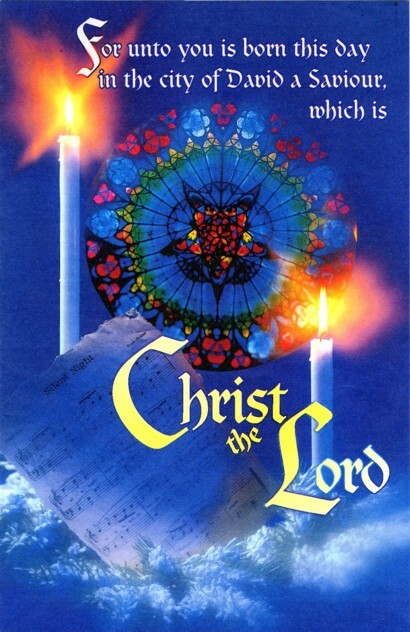 In this Levi picture, we see one candlestick on each side of him; similarly, the church bulletin depicts the candles on each side of a songsheet. 4. Conjuring Ritual Sheet versus a Songsheet: Levi is shown holding up a roughly shaped sheet on which he has written specific ritual instructions. In the church bulletin, we see a roughly shaped songsheet. 5. "As Above, So Below": In the picture of Levi, we see the Sabbatic Goat [Satan] pointing upward with one hand, and downward with the other. This gesture depicts the Satanic belief in Yin - Yang, also stated, "As Above, So Below", also known as the "balance of Nature". In the church bulletin, we see numerous triangles formed around both the large and the small circles, some pointing up and others pointing down. This symbolism depicts exactly the same belief, "As Above, So Below". 6. Three Concurrent Circles: Levi is standing in the middle of a rug on which three circles are painted. Levi is standing inside the smaller, inner circle. Around that smaller circle is a larger circle, which is surrounded by yet a larger circle. In the church bulletin, we also see three circles, do we not? We see a small inner circle in which the Goatshead [Satan] is located rather than Levi the Wizard. Surrounding the inner circle is a larger circle, which is surrounded by yet a larger circle. Since the number 'three' is a sacred number because it represents the Pagan Trinity, we would need to have three circles in the church bulletin if this symbol is, indeed, Satanic; and, we do have the three circles! Circles are critically important to the Satanist, for they symbolize spirit. They describe "the whole cosmos -- everything which is spiritual, everything embraced by the vast realm of the heavens." [Goodman, p. 17] Thus, it is highly appropriate that Levi would utilize circles in his Demon Conjuring Ritual, and equally appropriate for the Goatshead Pentagram in the church bulletin to be surrounded with three concurrent circles. 7. Brightness of light: in the Levi depiction, we see the standing demon appearing in a triangle surrounded by an aura of bright light. In the church bulletin, we see one of the major groupings of triangles illuminated by the flame of the candle. In both pictures, the bright light is within a triangle off to the side of the Wizard -- Goatshead -- located within the inner circle. This illumination represents "enlightenment" into the darker esoteric, demonic world. In summary, we have identified seven (7) common elements in both pictures: the Levi Demon Conjuring Ritual and this Church Bulletin! The chances of all these 7 elements being accidental are so remote as to be laughable! Thus, these four-petaled flowers represent the Satanic "life-force" that sustains and directs Astrology, Alchemy, and Demonology, and they are most powerful when they are placed in the center of a Seal of Solomon. Once more, we have a very common and most potent Satanic symbol -- the 4-petaled flower -- on this church bulletin! As you can see from these three triangles, the occultist typically places triangles in sequence. While I could not find any picture demonstrating it, many times a set of three triangles are alternating, with one triangle pointing up while the other two are pointing down, or vice versa. Now, look carefully at the outer, larger circle of this church bulletin. You will notice red clusters with a triangle drawn in the middle in blue. You can see that some of these red clusters have the blue triangle pointing up, while other triangles are pointing down. We see other instances in which the red cluster stands alone, but still has a blue triangle etched inside. 1. The triangle is a symbol of spirit, or spiritual matters. 3. The triangle is the Portal through which the demon in Eliphas Levi's Conjuring Ritual came into this dimension. The triangle is a most common, and most preferred, portal of entry into this dimension. In this church bulletin, we have five instances of three clusters of triangles around the outer larger circle, for a total of 15 blue triangles; we also have five instances of a single cluster with a blue triangle inside, for a total of 20 blue triangles; however, the candle flame hides one of the blue triangles inside a red cluster, and the songsheet hides another single red cluster. This means that only 18 blue triangles are visible! [NOTE: You will need to blow up the church bulletin picture on your paint program, for then you can see the very faint three blue triangles within the candle flame not really visible with the naked eye at the normal size]. To the Satanist, the number '18' secretly represents Antichrist, because it is formed by '6 + 6 + 6 = 18'. The flame only hides one blue triangle, and the ragged corner of the songsheet hides the other single cluster. This picture has exactly 18 blue triangles, which means this picture has 18 portals through which demons may enter this dimension! We have written nearly 800 articles since 1991, in which we demonstrate, that once Israel came back to her land in 1948, events have moved inexorably to the conclusion of all things, to the appearance of Antichrist and to the End of the Age. All prophetic signs are present, either having already been fulfilled, or the stage being set for their fulfillment. One of the major prophecies concerning the appearance of Antichrist is that he cannot arise, until the apostasy of the Christian Church occurs first [2 Thessalonians 2:3]. Listen: "Let no one deceive or beguile you in any way, for that day will not come except the apostasy comes first, [unless the predicted great falling away of those who have professed to be Christians has come, and the man of lawlessness is revealed, who is the son of doom (of perdition)." [Parallel Bible, KJV/Amplified Bible Commentary]. What this Scripture is saying is at once very simple and yet profound. The Holy Spirit is telling us here that the Antichrist ["Man of Lawlessness", and "Son of Perdition"] would like to arise, but cannot until the time has come when the great majority of people who call themselves Christian have fallen away. What does this phrase mean, "fallen away"? It literally describes that situation where Christians start to drift away from the key doctrines of the Bible that they once held dear and true. When leaders of denominations begin to deny the Virgin Birth, the Inerrancy of Scripture, the fact that Jesus is the only way to Heaven, or several dozens of other key doctrines, that person is literally opening the spiritual door to Antichrist. 1. Israel came back to her land as a nation on May 15, 1948, fulfilling many Biblical prophecies. 2. The Protestant Church began to slide into apostasy in 1948, when the World Council and National Council of Churches were formed. Numerous key doctrines began to be denied, and Christian leaders formerly thought as true Fundamentalists began to betray their followers [Read Dr. Cathy Burns' new book, "Dr. Graham and His Friends: A Hidden Agenda " for full details]. 3. The world was quietly reorganized into 10 super economic nations from December 31, 1992, to the end of 1996. This development fulfilled Daniel 7:7-8, and set in motion the next prophesied step, the appearance of Antichrist. 4. The world began to move to a cashless society driven by computers that not only will fulfill Revelation 13:16-18, but will also fulfill the Mark of the Beast. 5. Politically, the world has moved into global cooperation through the United Nations in such close cooperation that one can only believe that the global government with enforcement powers is not too far ahead. There are many other instances where current news events are propelling us into the New World Order, a.k.a. the Kingdom of Antichrist. But, you get the point: for the first time in world history, the Holy Spirit is slowly removing His restraining power so that Satan can gradually marshal his global forces to stage the appearance of his Antichrist. This church bulletin fiasco could only have been possible if the Holy Spirit allowed it to occur. Therefore, we have one more instance which demonstrates that the "restraining power" is being lifted! All these occult and Antichrist symbols on this church bulletin tell us that the "Christ" and the "Lord" depicted on this bulletin is not Jesus Christ, but the New Age Christ, Maitreya the Christ! ""Their script is now written, subject only to last-minute editing and stage directions. The stage itself, albeit as yet in darkness, is almost ready. Down in the pit, the subterranean orchestra is already tuning up. The last-minute, walk-on parts are even now being filled. Most of the main actors ... have already taken up their roles. Soon it will be time for them to come on stage, ready for the curtain to rise. The time for action will have come." ["The Armageddon Script" , by Peter Lemesurier, p. 252, written in 1981]. Satan certainly worked with an artist of Designs in Worship to deliberately create such an abominable depiction as this Goatshead Pentagram in this church bulletin. What were the goals Satan hoped to achieve by successfully planting this horrible Satanic depiction in a church bulletin carried by Fundamental Baptists, and probably other denominations? 1. Satan wanted to demonstrate his newly found spiritual power. As the Holy Spirit withdraws His restraining spiritual and political power, Satan is going to rush in to fill the vacuum. Occultists today can sense that their side is "winning", that it is getting stronger while the hated Christian Right is getting weaker. This depiction certainly demonstrates this new position of spiritual strength, as Satan has successfully invaded Jesus' turf. 2. Satan teaches his human followers that, if they can accomplish a plan in absolute secret -- without the "profane" knowing that anything had happened -- their spiritual power would be far greater. In other words, more spiritual power flows if an occult plan is carried out successfully without any of the regular people [the Muggles] ever knowing that anything had happened. Certainly, virtually 100% of the Christians attending services in which this bulletin was given out never, ever realized anything was wrong. Virtually no one ever looked at that inverted Pentagram and realized they were looking at one of the most evil, and spiritually powerful, symbols in Satan's arsenal. 3. 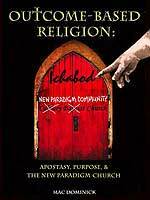 God may allow a "Spirit of Ichabod" to begin to take root in the church(es) in which this bulletin was distributed. A false religion to a false god has been allowed to occur, creating a false temple to Satan. The pastor may suddenly find himself in a spiritual battle that is unprecedented in his life. He may find the spirit of rebellion taking hold in his congregation, or find a spirit of the flesh to begin to flow in. If the pastor does not realize what has happened to him, and allows more such symbols to come into his church, then the Satanic spirit gains ever increasing power over that church. The pastor and his leadership must realize what has happened to them, and must repent. Ideally, every person in the congregation who was there at the time this bulletin was distributed must be made aware of what happened and repent. Even if these people were ignorant of this symbolism, they need to pray repentance; remember, ignorance of the law is no excuse before God. Pastor and congregation needs to take stock of their true spiritual condition before Jesus Christ, for they must confront the question as to why the Holy Spirit within them did not scream out at them that something was deadly wrong with that bulletin. Are they truly walking closely with Jesus Christ, if they would not be spiritually warned that something was deadly wrong? 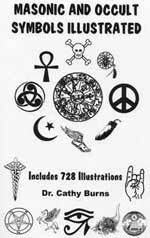 Since this symbol is of Antichrist, this bulletin can create a "soul-tie" back to Lucifer. The church comes under a curse. 4. God forbids any of His people to take a "cursed object" into their house. Listen: "Neither shalt thou bring an abomination into thine house, lest thou be a cursed thing like it: but thou shalt utterly detest it, and thou shalt utterly abhor it; for it is a cursed thing." [Deuteronomy 7:26] A "cursed object" is something created originally as an object of Satan worship, or a symbol of his power. Thus, any idol is a cursed object, including a cute little Kachina Doll you might have purchased while vacationing in the Southwest, for example. Anyone who took this cursed symbol on this bulletin into their home is in violation of God's command here. Satan will thus have the legal spiritual authority to have his demons enter your home to afflict you and your family. At this moment, Satan has created a "spiritual stronghold" in the family. Perhaps you will suddenly find a spirit of contention that was not there before. Siblings may start fighting more, Mom and Dad may suddenly be fighting more. Parents and children may suddenly be set against each other. These situations are good examples as to how demonic influence can enter your home to afflict you. Perhaps your children suddenly do not want to go to church, or have family devotions, or hear about Jesus Christ. Dad may suddenly find himself afflicted by tremendous "spirit of fornication" temptations. Either Mom or Dad may suddenly find themselves fighting an old habit that they thought they had disposed of forever. By simply taking this "cursed object" into your home, demonic affliction could become a tremendous reality. 5. Satan might be sending a signal to the outside world, and to his own within the church, that he is finally triumphant over Jesus Christ in the 2,000-year-long battle over control of the world. Certainly, as the Apostle Paul stated in 2 Thess 2, Antichrist has always wanted to arise, which means Satan has always wanted to have the power to make him arise. Up until this moment, Satan has been unable to make his move to control the entire world as End of the Age prophecy says he will. 6. Does the flame on the right symbolize destruction of the stained glass by fire? When you take a close look at the flame on the right of this outer circle on the church bulletin, it almost seems that the flame is so hot as to threaten this stained glass symbol with melting, with destruction. Satan certainly plans on forcing upon the world such draconian acts of judgment as are described in Revelation, chapters 6-19. The world will go through a massive destruction, much of it by fire, during the 7-year reign of Antichrist. 7. Satan may be sending a signal to his own people, that the appearance of Antichrist is very close. Illuminists love to do this kind of thing, sending signals in code that only their own will understand, while the regular people do not know that anything of note has even occurred. If this depiction was meant as a coded symbol that Antichrist is almost ready to enter the world scene, then this depiction is perfect. Remember, the term, Antichrist, literally means "coming in the guise of Jesus Christ", pretending to be Him. Truly, this symbol perfectly illustrates this perfectly; this "Christ the Lord" symbolized by the Goatshead Pentagram, is coming in the "guise of Christ".